Here’s an interesting comparison between virtual world games and how people behave in them, compared to the real world. 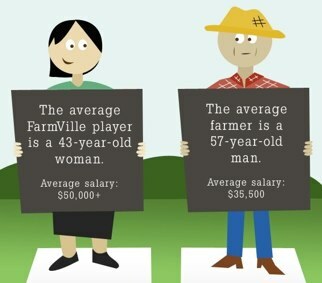 This infographic comparers various statistics between Farmville farms, from Facebook and real farms across the country and around the world. Interestingly, while 930 million acres are farmed in the US, Farmville players cultivate 500 million acres. I’m wondering what kind of discussions might be generated from examining this graphic.